The bridge spanning the Spray River 6 km south of Banff was destroyed by record high water last June. Parks Canada replaced it with a new span at Christmas. Photographed by Chic Scott last week. According to Banff National Park superintendent Dave McDonough, the record storm and flooding that hit the Canadian Rockies in June 2013 caused $19 million in damage to the park. Approximately half of that was to infrastructure, and much of that was the loss of 49 bridges on backcountry trails. But a lot of repair work has been completed since the storm. The Spray River bridge at km-6 on the Spray River Circuit (13) was replaced just before Christmas. While used by hikers and cyclists in the summer, the trail is even more popular with skiers in winter. 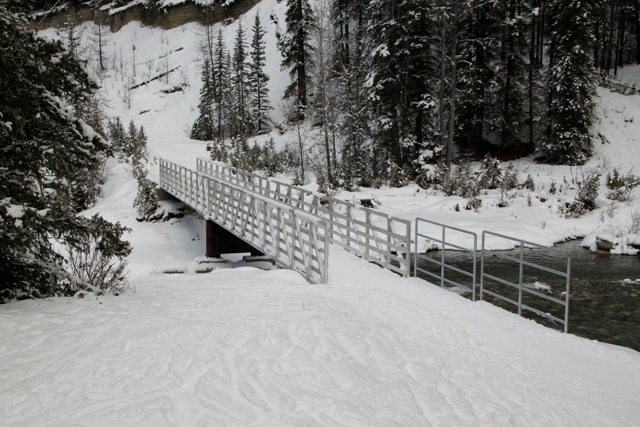 Two important backcountry bridges on Forty Mile Creek were replaced last autumn—one at km-3 on the Cascade Amphitheatre (5) and Elk Lake (6) routes and another further upstream, at km-4 on the trail leading towards Edith Pass (17), Mystic Lake (20) and Forty-Mile Summit. The first bridge at km-3 on the Healy Creek trail (28) was also washed out and replaced in October. Damage to the trail leading towards Healy Pass was not significant, and as of this posting it is in good shape for skiing. Two bridge replacements still in the design phase are more substantial—the bridge crossing Healy Creek near the bottom of the Sunshine Road (70) and the one spanning the Cascade River at km-6 on the old Cascade Fire Road (77). Both are on popular routes used by cross-country skiers and mountain bikers. All numbers in parentheses refer to trails as they are presented in the 9th edition of the Canadian Rockies Trail Guide.